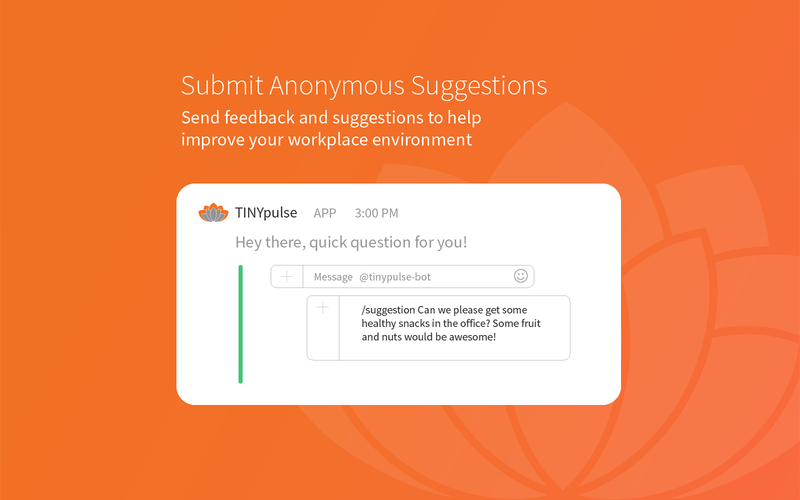 TINYpulse is the leading employee engagement platform, offering innovative pulse surveys, peer recognition, and anonymous suggestions to boost employee productivity and retention.With the TINYpulse Bot, employees can use TINYpulse’s Engage platform right from Slack. 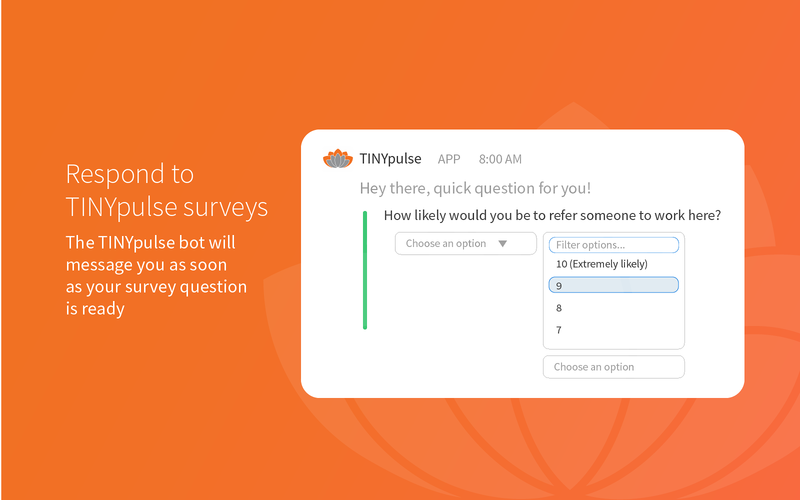 With simple commands, TINYpulse users can:* Respond to pulse surveys - customizable weekly queries that can range from “How valued do you feel at work?” to “Where should we hold the company holiday party?”. This provides actionable, specific data for executives to reference in decision-making. 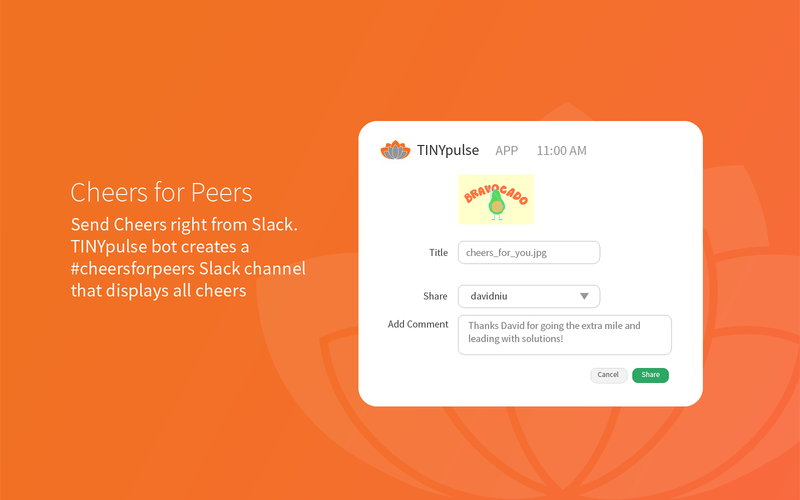 * Recognize their coworkers using TINYpulse’s popular “Cheers for Peers” feature, where employees can celebrate wins both big and small. This furthers a culture of recognition, which research indicates is crucial to employee engagement and productivity. 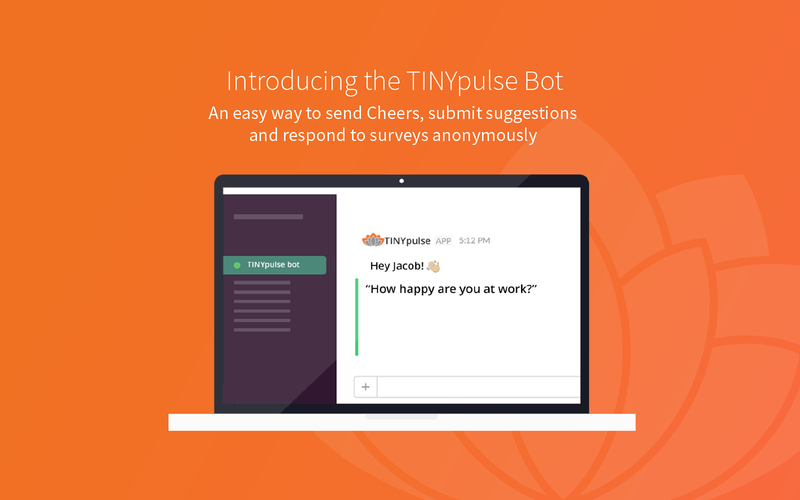 * Submit anonymous suggestions to management - who can then address and resolve suggestions in the main TINYpulse platform, improving transparency and raising morale.Installing the TINYpulse Bot also automatically creates a #cheers4peers feed where all Cheers are automatically posted, encouraging more recognition, appreciation and engagement. (It’s usually full of .gifs and positivity. 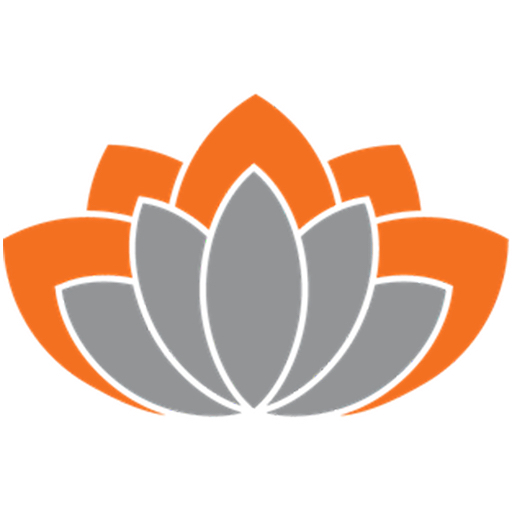 )To get started, you must be the administrator of a TINYpulse account. Want to see the TINYpulse Bot in action? Sign up to try TINYpulse for free: https://www.tinypulse.com/signup To read more about TINYpulse Bot, visit: https://www.tinypulse.com/slackTo read the story behind TINYpulse Bot, visit: https://www.tinypulse.com/blog/use-tinypulse-slack-bot-to-keep-employees-engaged-and-productiveGive feedback to TINYpulse's Slack developers by emailing support at tinypulse dot com. TINYpulse will be able to send messages to your workspace. TINYpulse will be able to view the email addresses of your Slack workspace’s members. TINYpulse will be able to access basic information about your public channels (including names, topics, purposes, creation date, and latest message). TINYpulse will be able to modify information about your public channels, including name and purpose, as well as archive and create new ones. TINYpulse will be able to post to specific channels in Slack. TINYpulse will be able to access basic information about your private channels (including names, topics, purposes, creation date, and latest message). TINYpulse will be able to access the names, descriptions, and members of your workspace’s User Groups. TINYpulse will be able to modify information about your private channels, including name and purpose, as well as archive and create new ones. TINYpulse will be able to install a bot user that appears in and has access to your workspace’s directory. It can also post messages and view activity on messages in any channel it is invited to. TINYpulse will be able to access profile information for all users on your workspace, including names and contact information. TINYpulse will be able to access any messages and activity you can see in public channels. TINYpulse will be able to access any messages and activity you can see in private channels. TINYpulse will be able to access emoji reactions on your workspace along with associated messages, files (including contents and information such as who uploaded it, when it was uploaded, and sharing history), and who added the 'reaction'.